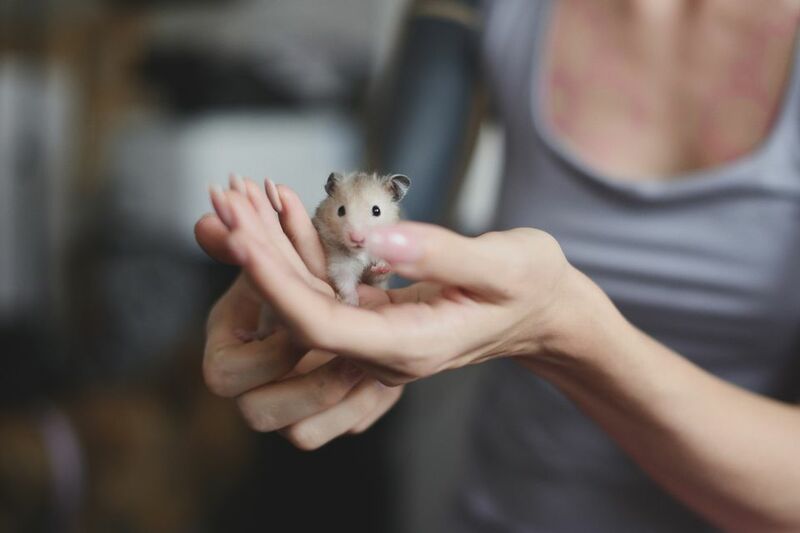 A hamster might be a small animal, but choosing a healthy pet is important, no matter what the size. Before bringing a hamster home, examine the animal's body and get to know its personality to ensure it's the right pet for you. Look at the hamster's surroundings at the pet store, too—he cage should be clean, offer easy access to fresh food and water, and not overcrowded with other animals. Hamsters kept under good conditions will be less stressed and have less exposure to disease, meaning your pet will be likelier to live longer. Take an opportunity to pick up the hamster and handle it for a few minutes. Look at the overall body condition—a hamster should be neither fat nor skinny, with no swellings. The hamster's coat should be well groomed—that is, fluffy and smooth—with no bare patches where fur has been pulled out. Check for soiling around the rear end, as this may indicate a problem with diarrhea. The hamster's eyes, nose, and ears should be clean and free from discharge. Check the fur around the eyes and nose for signs of wetness, staining or crusts. Although it might not be possible, try to get a look at the teeth, as they should not be overgrown and should be well-aligned. Also, check for wet or matted fur on the chin. Observe the hamster's breathing, which should be quiet and not labored, with no wheezing, clicking, or gurgling noises. Now, put the hamster down and watch it move around. It shouldn't display any signs of lameness, stiffness, or reluctance to move. Hamsters should be bright and curious in attitude and never lethargic. This can be a bit hard to judge in a nocturnal animal like a hamster, but with attention—and perhaps some very gentle prodding—a hamster should wake up and seem to be inquisitive about what is happening. Observe how the hamster reacts to people. Although most will be skittish at first, try to pick a hamster that is relatively calm about being approached, as well as OK with being handled by people. Try to find out the age of your hamster, and adopt one that is as young as possible—around 6 weeks old is best. If any of the hamsters in the same cage—or even at the same store—seem ill, resist the temptation to adopt from there. If it is contagious, your hamster may fall ill next, perhaps even after you have already taken it home. Make sure the store separates males and females. Familiarize yourself with the differences between males and females, and if the store doesn't separate them or seems unsure about the gender of the hamsters, move on to another store. It is best to avoid the possibility of surprise litters, especially in very young hamsters. If the shop will not let you handle the hamster before you buy, it is best to move on as it is definitely worth trying to handle a potential pet to assess its temperament.